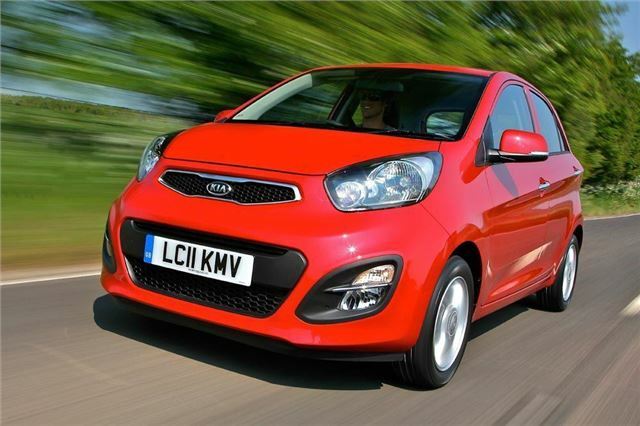 The new, second-generation Kia Picanto goes on sale in the UK on 17 June and sets out to prove that small cars can offer more of everything without ballooning in size and cost. Kia's smallest car offers stronger performance with lower fuel consumption and CO2 emissions than its predecessor; more style with much higher quality, without a premium price tag; more space, despite barely increasing in size; and huge steps forward in safety and luxury. The car goes on sale with brand-new 1.0 and 1.25-litre Kappa-family petrol engines, which deliver fuel consumption improvements of up to 8.5mpg with CO2 reductions of as much as 15g/km - yet in every respect performance is significantly better. The larger engine is available with Kia's EcoDynamics fuel-saving technology - an Intelligent Stop & Go (ISG) engine stop/start system, or, alternatively with an automatic transmission. The three-cylinder 1.0-litre unit develops 68bhp and 95Nm of torque and has an outstanding combined fuel economy of 67.3mpg. The 1.25-litre four-cylinder version of the Kappa engine is offered in three guises, all developing 84bhp and 121Nm of torque. In standard form it averages 60.1mpg. With a four-speed automatic transmission fuel consumption is an impressive 53.3mpg. Finally, there is the EcoDynamics version with fuel consumption at 65.7mpg. 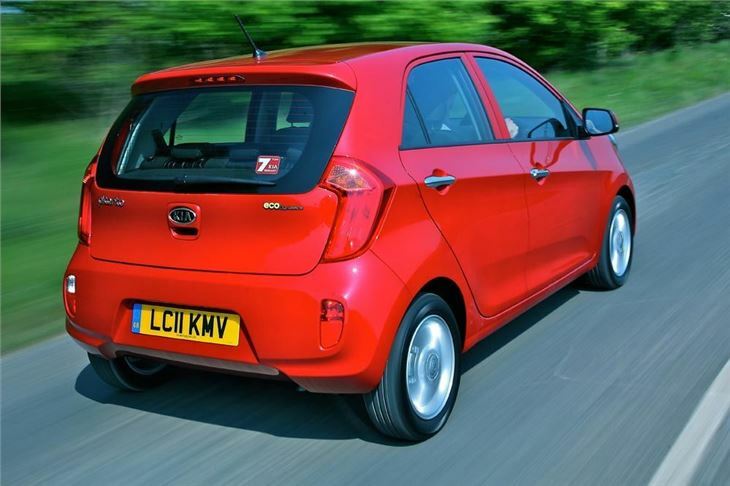 The Kia Picanto five-door goes on sale with four easily understood trim grades, badged 1, 1 Air, 2 and 3. And as buyers have come to expect from Kia, there has been no skimping on the specification. Standard features include body coloured bumpers, mirrors and door handles, electric front windows, Radio/CD player, trip computer and an immobiliser. A height-adjustable driver's seat and tilt-adjustable steering column provide driver comfort whilst all occupants are protected by a total of six airbags. A 60:40 split folding rear seat allows rear luggage space to grow up to 870 litres (VDA). 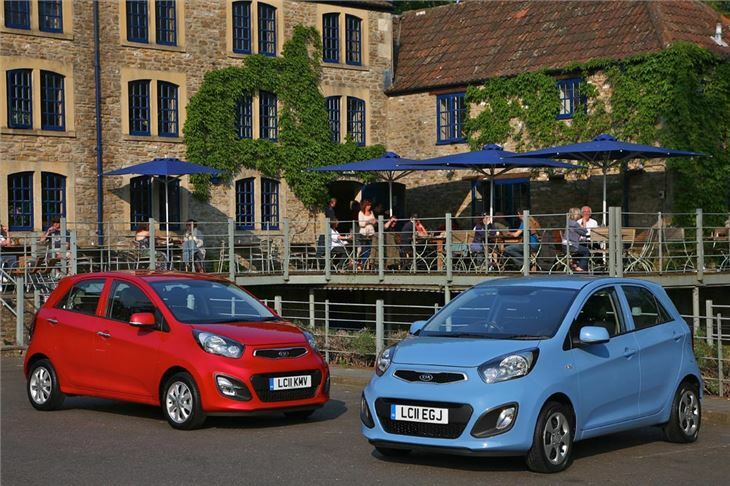 The Picanto 1 Air provides an option for those customers who want air conditioning, and the fantastic value of the 1 specification, but without upgrading to the well specified mid-grade 2 version. Picanto 2 adds a host of additional equipment typically seen on cars from the B-segment and above such as Bluetooth connectivity, with voice recognition and full iPod control with USB & AUX ports - both of which can be operated by the steering wheel controls - and electrically operated, heated and folding door mirrors with integrated LED side repeaters. Air conditioning, rear electric windows, 14" alloy wheels, front fog lights, a leather steering wheel and gear lever, an alarm system, premium black upholstery and chrome exterior detailing complete the comprehensive spec package. The top-of-the-range 3 spec adds premium features such as automatic air conditioning, heated front seats, a 6-speaker stereo system, 15" alloy wheels, body-coloured side skirts and automatic headlights with LED daytime running lights and unique LED rear lamps. 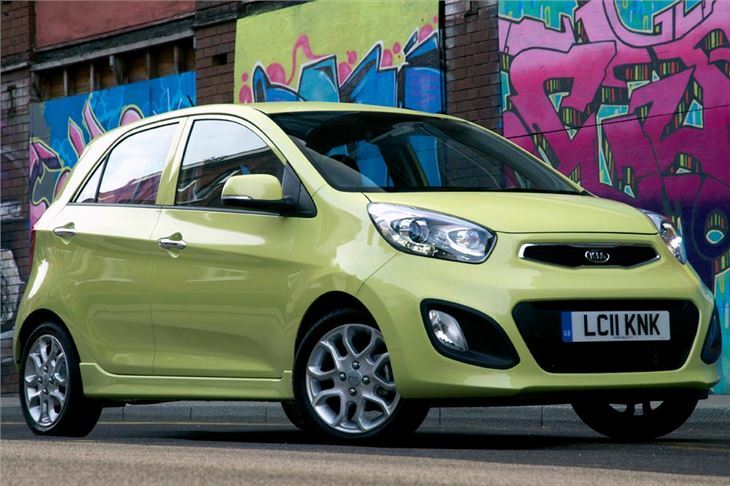 As with all new Kias, a seven year or 100,000 miles fully transferable warranty is standard on every new Picanto. Under Chief Design Officer Peter Schreyer, Kia has undergone nothing less than a design metamorphosis in recent years. That process continues with the bold new Picanto, which advances Kia's reputation as a manufacturer of trend-setting cars. The new Picanto sees a courageous change of direction. Where the previous model was regarded as ‘cute' and ‘feminine', the new model has muscular wheel arches, low and wide rocker panels and wide-set alloy wheels on the two upper trim levels. The expressive front end blends into strongly sculpted and dynamic sides which emphasise the car's strength and maturity and give it a premium presence. Attention to detail is everywhere and has resulted in the new Picanto having a drag co-efficient of Cd 0.31 - far better than the majority of A-segment cars and a useful contributor to its significantly improved fuel economy and emissions. Later this year the five-door Picanto will be joined for the first time by a three-door version with its own distinctive style. The three-door model will have a unique C-pillar, bumpers, grille and exhaust to give it a subtly sportier look. The Picanto's new-found maturity is reflected in the interior design and the choice of sophisticated trim materials, which set a new benchmark in the A-sector for quality. The major controls are arranged in a way that is attractive while ensuring they are easy to use. The layout emphasises the width and space of the cabin. The new Picanto is only 60mm longer than its predecessor so that it still occupies slightly less than 3.6 metres of road space, but an increase of 15mm in wheelbase allied to some clever packaging ideas have resulted in significantly more cabin space. Front legroom has increased by 36mm, for example, while luggage capacity is 27% greater at 200 litres - and all with no change in the Picanto's height or width. The new Picanto comes with revised running gear. Featuring MacPherson struts at the front and a coupled torsion beam axle at the rear, a layout which gives the best combination of ride and handling while minimising intrusions into passenger and luggage space. The front suspension helps towards improved straight line stability, while longer wheel travel and softer springs give a suppler ride. The rear axle is stiffer in the new Picanto to improve agility. Stability and ride comfort also benefit. 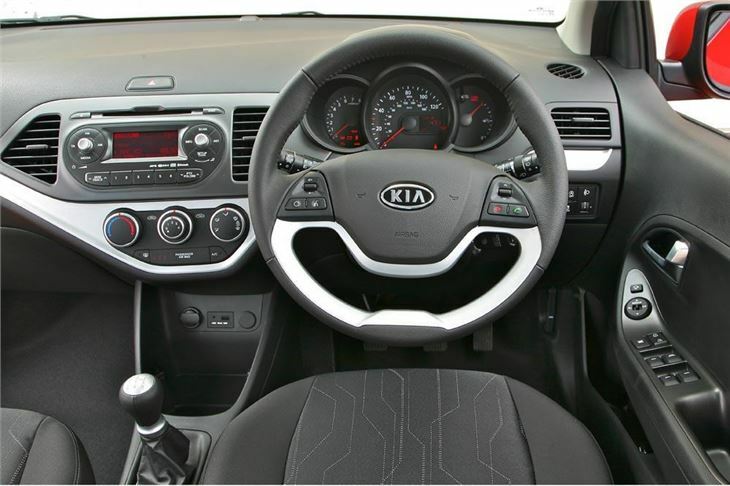 The steering system features Kia's acclaimed motor-driven power steering (MDPS). This delivers the twin benefits of reduced fuel consumption by drawing on engine power only when needed while reducing the driver effort needed for parking and manoeuvring. The new Picanto's defences begin with an incredibly stiff all-new body structure featuring a high percentage of high-strength steel and numerous reinforcements and additional bracing throughout the vehicle. And should the worst happen, every Picanto has front, side and curtain airbags to cushion heads and torsos against impacts from any angle. Front seat-belt pre-tensioners and load limiters brace occupants against a crash impact while reducing the risk of chest injury. Pedestrian safety is enhanced by a new cross member beneath the front bumper, plus a deformable cowling ahead of the windscreen and a bonnet striker plate which is offset by 50mm from the centre-line of the car. Click here to watch the video road test of the new Picanto.